Aged flour in breads and cakes improves color and gluten strength. Aged flour, often called unbleached flour, is aged and bleached naturally by oxygen in the air. It is more golden in color, generally more expensive and may not have the consistency in baking qualities that bleached flour does. 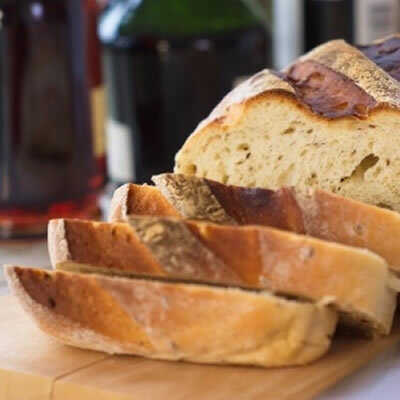 Unbleached is preferred for yeast breads because bleaching affects gluten strength.2 Unbleached flours have a creamy color because of the presence of carotenoid pigments in the endosperm. Since milled flours were an integral part of early humanity, the natural aging process was very much part of the early domestication of wheat crops. Here, flours were often stored for months at a time during winters, leading to a change in color and physical properties. For this reason, the exact origin of aged flour is largely unknown. However, the benefits of the aging process has been known for thousands of years. Chemical aging dates back to the early 1900’s, when the Pillsbury company pioneered the techniques of chemical aging. Creating aged flour is quite easy. After milling, the flour is allowed to naturally oxidize until the desired physical properties are reached. However, naturally allowing flour to age is an expensive endeavor. For this reason, chemical methods of aging are often applied by flour producers. The nutritive properties of aged and fresh flours are indistinguishable. While aged flour does not pose a danger to human health, the use of chemical aging should be viewed with caution, based on the current popularity of clean labels with consumers. Aged flour commonly has a lighter color than fresh flours. Additionally, aged flour is defined as having greater elasticity. When flour is aged for several months, oxidation restructures the proteins within the flour while starch remains rather consistent. Here, the influence of gluten becomes more pronounced, forming stronger bonds which lead to a more elastic dough. Oxidation also naturally bleaches the flour, creating a lighter colored flour. Aging flour can be costly, which is why chemical methods of ‘aging’ are typical of large scale flour producers. While dry flour seems chemically inert, a number of factors can influence its physical and sensory properties as it moves beyond the date of production. For this reason, aged flour is of great importance to bakers, especially with regards to color and gluten strength. Aged flour, and bleached flour for that matter, are GRAS. While little regulation is required for naturally aged flours, great care should be taken when creating chemically bleached flours. For this reason, consult the Code of Federal Regulations in regards to chemical bleaching terminology and allowable methods. Shelke K, Hoseney R, Faubion J, Curran S. “Age-Related Changes in the Cake-Baking Quality of Flour Milled from Freshly Harvested Soft Wheat.” Journal of Cereal Chemistry. 69(2):141-144. FDA Code of Federal Regulations. Also, azodicarbonamide, even though it is termed a bleach by CFR, does not whiten the flour. I was told years ago that it replaced chlorine dioxide in the flour additive trade, which did white the flour besides age it. Since the ageing properties of ADA mimicked that of chlorine dioxide, the description of ADA as a bleach was retained. It confuses a lot of people since they assume ADA is a whitener. This is the first time I see and article that addresses what I belive to be an important interaction, the age of the berries at milling time and the age of the flour post-milling at baking time. However, no statistics are provided to generate an idea of how long to allow the recently milled flour to age before it is used in bread making, in relation to the age of the wheat berries. Any idea or can you provide refrences in that subject? Preferably information that addressed home milled flour which as you know is quite different from flour used for commercial bread making, le the latter having only part of the original constituents of the berries.